The present invention includes a drug release system. The drug release system comprises a bulk polymer phase and a polymeric drug-enriched phase within the bulk polymer phase. At least one drug is incorporated into the drug-enriched phase. Another embodiment of the present invention includes a method for making a device for a continuous release of drugs. The method comprises providing a bulk phase polymer and providing a drug that is substantially insoluble in the bulk phase polymer. The method also includes providing a drug enriched polymer. The drug enriched polymer is substantially insoluble in the bulk polymer. One or more of the drugs are soluble in the drug-enriched polymer. The method further comprises providing a solvent. The bulk phase polymer, the drug enriched polymer and the drug or drugs are blended in the solvent so that the drug or drugs are incorporated into the drug receiving polymer and the drug enriched polymer is dispersed within the bulk polymer. FIG. 3 a is a perspective view of the drug delivery system of the present invention wherein the pore structure is discontinuous. FIG. 3 b is a perspective view of the drug delivery system of the present invention wherein the pore structure is semi-continuous. FIG. 3 c is a perspective view of another embodiment of the drug delivery system of the present invention wherein the pore structure is continuous. If the volume percent of the drug enriched hydrophilic phase is greater than about 30%, the hydrophilic polymer and drug will exhibit a pore structure  22 that is continuous throughout the volume of the bulk polymer 24, as shown generally at 20 in FIG. 2. The continuous pore structure 22 within the bulk polymer volume of the polymer 24 is defined as being above the percolation threshold. The elution of the drug from a drug release coating, such as is shown in FIG. 1, below the percolation threshold, is dependent upon the diffusion of the drug within the drug-enriched polymer  11 through the hydrophobic bulk polymer 12. This is contrary to the diffusion of the drug from a drug release coating above the percolation threshold, such as is illustrated in FIG. 2, which is dependent upon the diffusion of the drug from the pore network 22, and upon the mean pore length. Examples of such drugs include antiproliferative substances as well as antineoplastic, anti-inflammatory antiplatelet, anticoagulant, antifigrin, antithrombin, antimitotic, antibiotic, antioxidant, and combinations thereof. 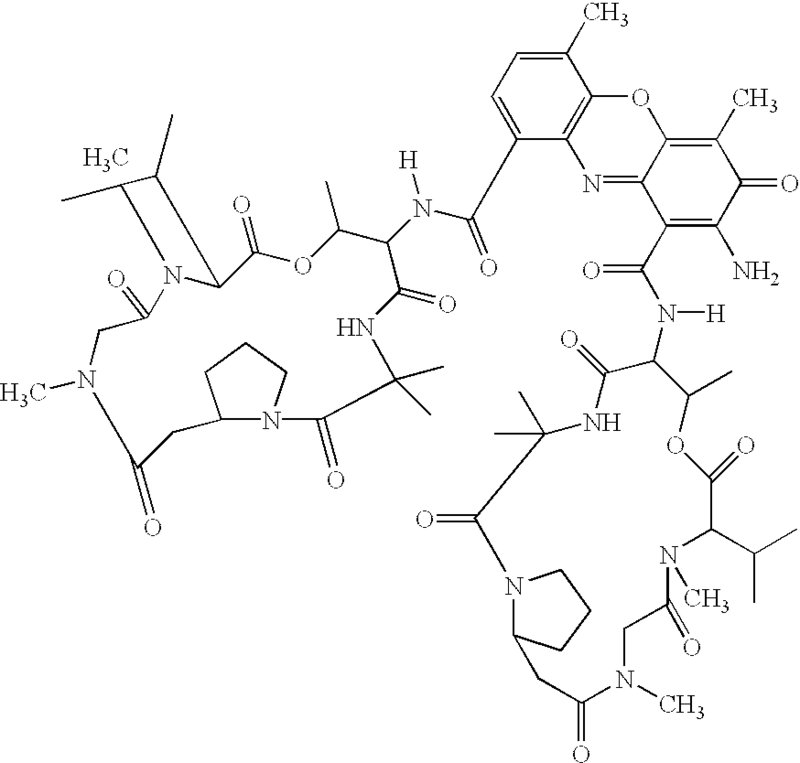 A suitable example of an antiproliferative substance includes actinomycin D, or derivatives and analogs thereof, manufactured by Sigma-Aldrich  1001 West Saint Paul Avenue, Milwaukee, Wis. 53233; or COSMEGEN available from Merck). Synonyms of actinomycin D include dactinomycin, actinomycin IV, actinomycin I1, actinomycin XI, and actinomycin C I. Examples of suitable antineoplastics include paclitaxel and docetaxel. Examples of suitable antiplatelets, anticoagulants, antifibrins, and antithrombins, include sodium heparin, low molecular weight heparin, hirudin, argatroban, forskolin, vapisprost, prostacyclin and prostacyclin analogs, dextran, D-phe-pro-arg-chloromethylketone (synthetic antithrombin), dipyridamole, glycoprotein Iib/IIa platelet membrane receptor antagonist, recombinant hirudin, thrombin inhibitor, available from Biogen, and 7E-3B, an antiplatelet drug from Centocore. Examples of suitable antimitotic agents include methotrexate, azathioprine, vincristine, vinblastine, antiproliferative agents include angiopeptin (a somatostatin analog from Ibsen), angiotensin converting enzyme inhibitors such as CAPTOPRIL, available from Squibb, CILAZAPRIL, available form Hoffman-LaRoche, or LISINOPRIL, available form Merck, calcium channel blockers such as Nifedipine, colchicine, fibroblast growth factor (FGF) antagonists, fish oil, omega 3-fatty acid, histamine antagonists, LOVASTATIN, an inhibitor of AMG-CoA reductase, a cholesterol lowering drug from Merck, a cholesterol lowering drug, monoclonal antibodies such as PDGF receptors, nitroprusside, phosphodies terase, inhibitors, prostaglandin inhibitor, Seramin, a PDGF antagonist, serotonin blockers, steroids, thioprotease inhibitors, triazolopyrimidine, a PDGF antagonist, and nitric oxide. Other therapeutic substances or agents which may be appropriate include alpha-interferon, genetically engineered epithelial cells, and dexamethasone. The graft copolymer with a molecular weight of 3200 daltons is functionalized with 0.27 mol percent of the hydroxyl functionalities of the poly(ethylene-co-vinyl alcohol) and has an average of two ethylene oxide polymers grafted to the polymer. The total volume fraction of hydrophilic polymer and drug occupies approximately 35% of the polymer matrix and assumes a cylindrical-like pore morphology. The grafted co-polymer with a molecular weight of 3200 daltons functionalized with 0.68 mole percent of the hydroxyl functionalities has an average of five co-polymer segments attached to any given polymer chain. The hydrophilic graft polymer volume containing the polyethylene oxide functionality and the drug, forming a drug enriched polymer, are present at approximately 50 volume percent. The drug enriched polymer assumes a lamellar structure as is shown at  40 c in FIG. 3c. The morphologies of the drug enriched graft polymer  32 within the bulk polymer substrate 34, are shown at 40 a, 40 b and 40 c, respectively, in FIGS. 3a, 3 b and 3 c. These different morphologies are due to an increasing concentration of the drug enriched polymer phase 32 a, 32 b and 32 c, respectively, in which one or more drugs is incorporated. At higher concentrations, the drug enriched polymer phase coalesces to form a lamellar morphology. The drug release embodiment 40 a, shown in FIG. 3a, is a discontinuous pore structure, with the drug-enriched polymer phase 32 a discretely dispersed in the bulk phase 34 a. The drug-enriched polymer structure  32 b in FIG. 3b has a semi-continuous phase and in FIG. 3c, the drug-enriched polymer 32 c has a continuous phase in which the drug is soluble and diffusible from the continuous phase, when implanted into a living being. The semi-continuous phase 32 b comprises sites that are discrete in cross-section but continuous in a longitudinal direction, as is shown in FIG. 3b. The continuous phase 32 c, shown in FIG. 3c, defines a channel 33 c in which the drug is diffusible from the bulk polymer 34 c to the polymer interface 35. The drug-enriched sites are continuous in both cross-section and in a longitudinal direction. One exemplary composition that produces the drug release morphology of FIG. 3 c includes an EVAL polymer with 66 weight percent ethylene groups, 43.32 weight percent vinyl alcohol functionalities and 0.68 weight percent vinyl ether groups. The weight percent refers to the percent of the total drug release system weight. The vinyl ether groups were functionalized with PEO-isocyanate, which forms a urethane linkage, using groups that have a molecular weight of a side group of 3200 g/mol. The side groups comprise 33 weight percent of the total EVAL/PEO polymer. The composition of the PEO-isocyanate blend is 75 weight percent functionalized EVAL and 25 weight percent drug. This composition gives rise to a 50 weight percent hard, bulk phase and a 50 weight percent drug/PEO side chain phase. The final structure is a lamellar structure. (x) =66 weight%; (y)=44 weight%. M is approximately equal to 70 units. Molecular weight is approximately 3200 units. With the drug release system such as is shown at  40 c in FIG. 3c, drug release is substantially continuous within a human being. at least one drug incorporated into the drug-enriched phase. 2. The drug release system of claim 1 wherein the drug-enriched phase comprises discrete, discontinuous sites within the bulk phase. 3. The drug release system of claim 1 wherein the drug-enriched phase comprises sites within the bulk phase that are discrete in cross-section but continuous in a longitudinal direction. 4. The drug release system of claim 1 wherein the drug-enriched phase comprises sites within the bulk phase that are continuous in both cross-section and in a longitudinal direction. 5. The drug release system of claim 1 wherein the bulk phase comprises a hydrophobic component and a hydrophilic component. 6. The drug release system of claim 1 wherein the bulk phase comprises poly(ethylene-co-vinyl)alcohol. 7. The drug release system of claim 1 wherein the bulk phas e comprises polyethylene glycol. 8. The drug release system of claim 1 wherein the drug-enriched phase comprises polyethylene oxide and at least one drug. 9. The drug release system of claims 1 wherein the drug-enriched phase comprises poly n-vinyl pyrrolidone and at least one drug. 10. The drug release system of claim 1 wherein the drug-enriched phase has a glass transition temperature that is less than the temperature of the living human body. 11. The drug release system of claim 1 wherein the drug-enriched phase has drug concentration that is greater than the percolation threshold. 12. The drug release system of claim 5 wherein the bulk phase comprises poly(ethylene-co-vinyl) alcohol with ethylene groups in a concentration of 66 weight percent, vinyl alcohol groups and vinyl ether groups in a concentration of about 0.68 percent by weight. 13. The drug release system of claim 9 wherein the drug-enriched phase reacts with the vinyl ether groups of the bulk phase to form a urethane linkage. 14. The drug release system of claim 10 wherein the drug-enriched group comprises polyethylene oxide-isocyanate. 15. The drug release system of claim 13 wherein the urethane linkage comprises about 33 weight percent of the drug release system. 16. The drug release system of claim 1 wherein the drug comprises Actinomycin D.
17. The drug release system of claim 1 wherein the drug comprises one or more of an antiproliferative substance, an antineoplastic substance, an anti-inflammatory, anti-platelet, anticoagulant, antifigrin, antithrombin, antimitotic, antibiotic, antioxidant and combinations of these substances. 18. A coating comprising the drug release system of claim 1. 19. The coating of claim 18 wherein the bulk phase polymer is deformable but is not deformable to the touch and wherein the coating has a uniform appearance at room temperature. 20. The coating of claim 18 and further comprising an implantable device to which the coating is applied. 21. The coating of claim 20 wherein the implantable device is a catheter or a stent or a guidewire. a treatment site wherein the drug delivery system releases one or more drugs. 23. The method of claim 22 wherein the implantable device comprises degradable capsules. an implantable device to which the drug release system is applied. 25. The device of claim 24 wherein the implantable device is a guidewire. 26. The device of claim 24 wherein the implantable device comprises degradable capsules. 27. The device of claim 24 wherein the implantable device comprises a catheter. 28. The device of claim 24 wherein the bulk phase comprise poly(ethylene-co-vinyl)alcohol. 29. The device of claim 24 wherein the drug-enriched phase comprises polyethylene oxide and at least one drug. 30. The device of claim 24 wherein the drug-enriched phase has a glass transition temperature that is less than the temperature of the living human body. 31. The device of claim 24 wherein the drug-enriched phase has a drug concentration that is greater than the percolation threshold. 32. The device of claim 24 wherein the drug release system is flexible. 33. The device of claim 24 wherein the drug release system has a generally uniform appearance. blending the bulk phase polymer, the drug enrichable polymer, and the drug in the solvent so that the drug is incorporated into the drug enrichable polymer and the drug enrichable polymer is dispersed within the bulk polymer to make the device. 35. The method of claim 34 and further comprising blending at a temperature that is less than the glass transition temperature of the drug enrichable polymer. 36. The method of claim 34 and further comprising blending at a concentration of drug enrichable polymer that is greater than the percolation threshold. 37. The method of claim 34 and further comprising blending to form a semi-continuous phase of drug enrichable polymer in the bulk polymer. 38. The method of claim 34 and further comprising blending to form a continuous phase of drug enrichable polymer in the bulk polymer. 39. The method of claim 34 wherein the solvent comprises one or more of dimethyl sulfoxide or N,N-dimethylacetamide. 40. The method of claim 34 wherein the drug comprises actinomycin D.
41. The method of claim 34 and further comprising applying the device for continuous release of drugs to an implantable device. 42. The method of claim 41 and further comprising drying the device for continuous release of drugs so that the device is flexible. 43. The method of clam 42 wherein the device for continuous release of drugs has a visually uniform appearance.